Pro road racer Nick Arciniaga steps onto the trails. 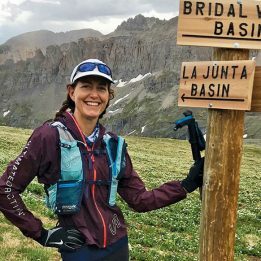 As more road and track athletes have moved into ultrarunning, records have fallen and new stars have emerged. But none of those recent crossovers have the raw marathon speed of Nick Arciniaga. 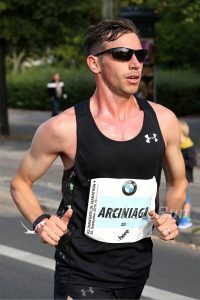 Arciniaga, a professional marathoner with a stellar 2:11:30 PR, 23 career marathon finishes and a win at the 2013 U.S. Marathon Championships, has now turned his competitive sights on the trails. 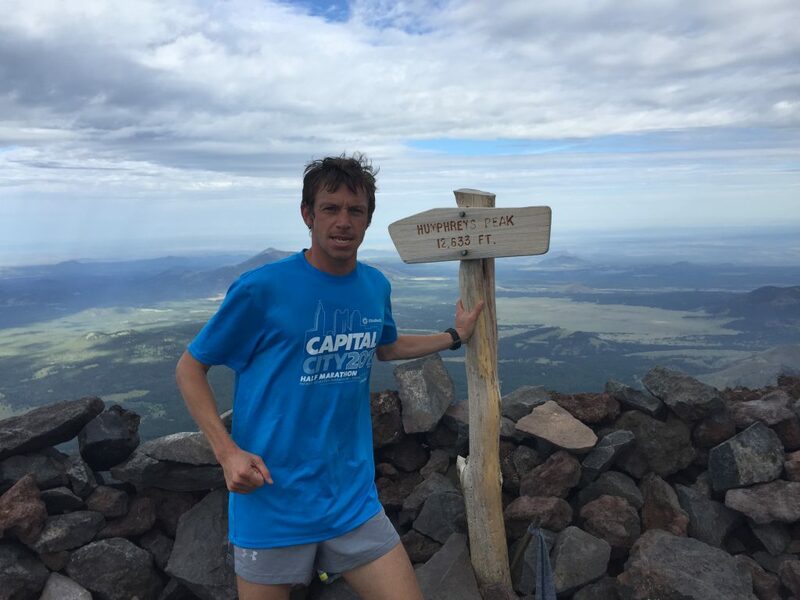 The 33-year-old has previously run in small-ticket trail races around Flagstaff, Arizona,where he lives. In the past couple months, though, he has stepped up to bigger races. In December, he placed second at the half-marathon XTERRA Trail Run World Championship, in Hawaii, behind perennial trail standout Joseph Gray (whose 10K and half-marathon PRs rival Arciniaga’s). 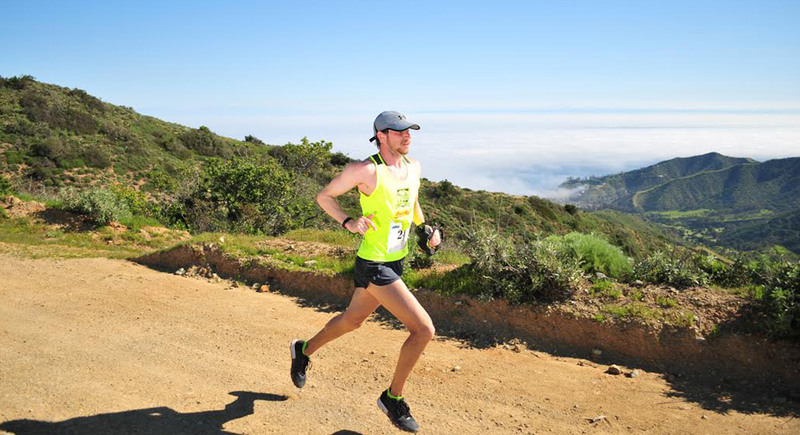 Then, on March 11, he won the Catalina Island Marathon in 2:46. 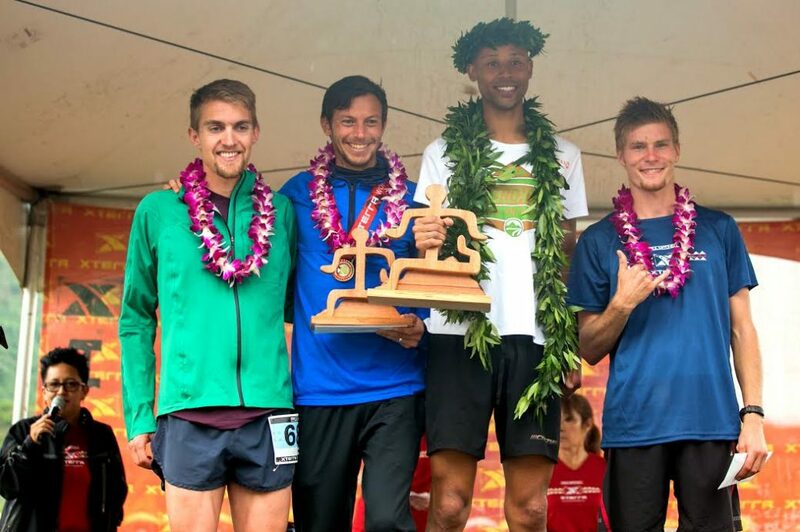 Arciniaga, second from left, on the podium with Joe Gray at the half-marathon XTERRA Trail Run World Championship in Hawaii. Photo courtesy XTERRA. 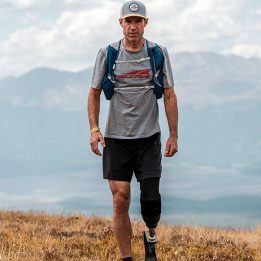 Arciniaga plans to make his ultra debut this December, at one of the sport’s most competitive races: The North Face 50-Mile in San Francisco. 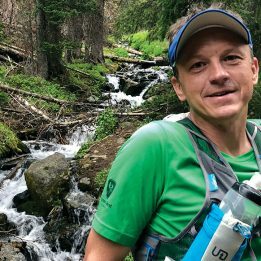 We spoke to him last month about his motivation for racing on trails, how he is tweaking his training and what he hopes to accomplish off the pavement. Ultras have always been a goal in my mind. Road racing was simmering down the past two years. I thought, OK, this might be a good time to transition. See how trail racing does for me, get out of the same rhythm, do something a little different. I finish most of my marathons pretty well, even when I’ve gone out super hard and faded. The second halves of my races have always been pretty respectable—I’ve finished a few negative splitting, knowing that I could have done a few more miles, maybe even 10 more, if I let off the gas a bit longer. People say you can train at a high volume and not break down as some others might. Do you think that will help you in ultramarathons? Absolutely. I’ve been able to run up to 150 miles per week, putting in those big-volume days and going 20 to 23 miles, day after day, quite consistently. So I know that my body will be able to handle the training. I’ll be transitioning to a lot more single-run days, rather than doubling as much as I used to. Making that small tweak in my training, plus adding in extra longer climbs, like going out to the Grand Canyon and doing some major uphills and downhills, to get my legs ready for those types of races—that’ll be my strategy going forward. In training, I’m going to try to put in those 30-, 40-, 50-mile runs, to see how my body holds up and learn some fueling strategies from that. Will running slower be a difficult adjustment? No, that won’t be too difficult. I’ve been running a lot of my easy days at seven- or eight-minute miles, just letting my legs feel things out and gradually pick it up. At Catalina, that was the plan: don’t really push from the gun like I would normally in a road marathon, just go out like it was a long-run type of effort. I was waiting to see how the legs would treat me about halfway. By the time I got to that point, I definitely felt like, OK, I’m not gonna be able to run any faster, but I can definitely maintain. Especially with those hills. They kind of ground me down. Is marathon fitness is a good benchmark for ultramarathon success, particularly beyond the 50K? There are a lot of other factors. It’s like comparing the half-marathon to the marathon, on the roads. So many guys can run super well for a half-marathon, but they can’t figure the marathon out, just because of the fueling and whatnot. The marathon will be a little bit more similar to the ultras—if you run a decent marathon, you should be able to transition better. But there’s still an unknown factor of how the body does. It’s not going to be linear by any means. Do you think more sub-2:12 marathoners will get into ultrarunning? In the U.S. right now, there are only about 10 2:11 guys. Most of them, from what I can tell, once they’re done running professionally, they’re just done. I’m going to end up as one of the few who actually enjoys running trails. Personally, I could see myself running until I’m 90 or whatever. It’s always going to be something that I’m going to go out and do, regardless of how competitive I am. Are you interested in more extreme mountain running, like skyracing, or fastest known times? FKTs possibly, but I can tell already, I’m not very good at skyracing. I might give it a couple of shots, see how they go, but I don’t see myself being very competitive. I can’t billy-goat my way up some of these climbs. You’ve already had a prolific career by the standard of elite road racing. Will you continue to focus on marathons, and try for another PR? Yeah. I can see road racing in my future. I might be doing the Pittsburgh Marathon in two months, to see where my body’s at. And a couple months ago I did the Berlin Marathon, where I was shooting for another PR and fell short—bad pacing. I still think I have many more years of road racing to go. I’m just going to be picking and choosing a little bit more carefully, in terms of which ones fit into a new hybrid of trail and road racing throughout the year. cool. best of luck Nick!